Creating my everyday: Happy (early) Valentine's Day! 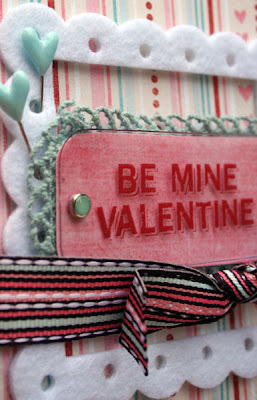 Before I show some Valentine's projects I made, I wanted to share this layout I made using CMK's February kit. I used Lisa's Friday Formula for this layout - she posts a new formula every Friday, and all the participants have the chance to win a RAK if you post your layout within the deadline. This layout shows one of Chloe's favorite new drama-queen poses, lol. Ok, nobody freak out, but I actually made a card! 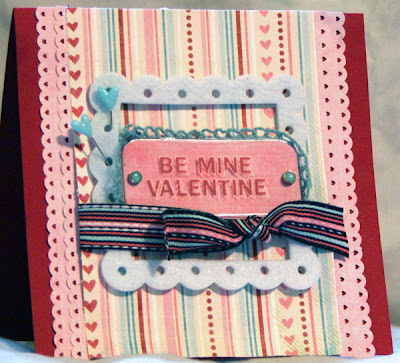 ;-) Cardstock is Bazzill, but everything else (patterned paper, felt, transparent label, stickpins, rub-ons, brads, trim and ribbon) is all Fancy Pants. Sorry for the crappy photo but it was raining outside so I had to take this one inside. 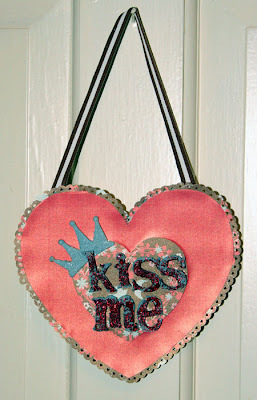 Lastly, I have a Valentine's Day wall hanging that I made also using CMK's awesome February kit. I altered an unfinished double layered wood heart from the craft store, but you could cut out a heart from chipboard, too. I am going to an all day, 12-hour crop next Saturday (the 21st), and I am sooo excited! I'm going with two friends, so it should be a lot of fun! Hopefully i'll have a lot to share when I return (oh, who am I kidding? I won't have that much to share, lol). Hope that everyone is having a great week and that you all get some extra hugs and kisses from your loved ones on Saturday! 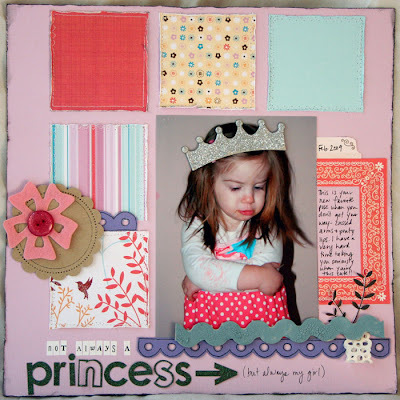 Love your projects...and look at that adorable pout! What a moment to capture! Hope you enjoy your V-day date! I just love those 12 hour crops!! I have one coming up the 28th too, I can't wait to go!!!!! No matter how much you end up getting done, it really doesnt matter cause it is so much fun, checking out and chatting with all the other ladies! Have a great time on your date!! 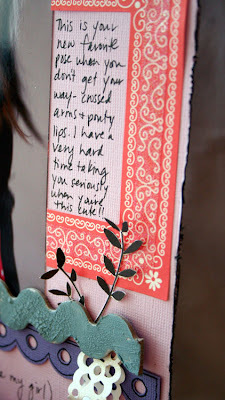 great V Day projects , Staci ! just adorable ! Good on yer with the upcoming crop & date night ! lol ! I don't think I've been to one . Benjamin Buttons might be fun - 3 hrs long !!! I only caught it on DVD ! haha ! 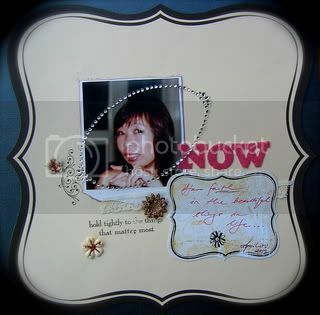 Oh that LO is just too cute, what a great memory to scrap, and you did a wonderful job, I love that design. Oh wow, a 12 hour crop, that sounds so much fun!! We don't have crops in my neighbourhood, I don't even know that many people here that scrap... Mind you, even if I could attend a 12 hour crop, I would not have much to share, not only am I a very slow scrapper (it takes me forever to take decisions on what materials to use), but I would chat way too much LOL. I hope you'll have a great time! Hi Staci. Thanks for leaving a consoling note on my blog regarding my severed relationship with Diet D.P. lol! Hate to hear you are battling a sinus infection...YUCKO! I know you don't want to hear this, but my vertigo is directly related to a sinus infection. Good news, I'm feeling a bit better today. All the meds and laying off the Dr. Pepper must be helping. Loved your projects. Your daughter's princess pout is perfect. Soooo little girl, huh? And, girl, you must keep making cards...that one was awesome! Hope you have a great time at your crop and certainly you will get much done! So share next week. OK? OK.
Love the LO and look at that card!!! Thanks so much for the kind words you sent me. Surgery went well, now I am dealing with the getting better part and that stinks!!!! No plans for us for Valentine's Day except Joe has a doctor appointment and then he is off to get the taxes done!!!! I was supposed to go to an all day crop on the 21st, but I think it will be too much!!! Have a Happy Valentine's Day!! Love all of your latest creations!!! And your little girl is just too cute! Love her new pose!!! Great projects as usual...that photo of your daughter is priceless! Have fun at your crop, sounds like a ton of fun! you make the cutest stuff ever!! Wish I could go croppin with you!! Your creations are amazing as usual!!! You little one is soooo cute!! She steals your heart!! Have a great week! Hope you have fun at your crop!! How fun and a date night, too! Hey cutie - love your projects - and i don't know what your talking about - your great at making cards!! Hope you and dh had a wonderful Valentines!! GREAT card!!!!! So excited for Saturday, although in a bit of a panic as I haven't cropped away from the house in over a year. What to pack!?! oh my, she is so adorable with that little pout on her face and the crown...i love it! beautiful pg. Staci..love all the different pp..